These days, I’m hearing more and more great bands coming out of New Zealand; The Brunettes is another band to emerge from the genre of achingly-sweet, bubblegum indie pop. Comprised of a boy/girl duo, they both share a dynamic through their contrasting vocal deliveries that radiates with a smooth charm-- but which unfortunately at times, can get a bit sickly-sweet. 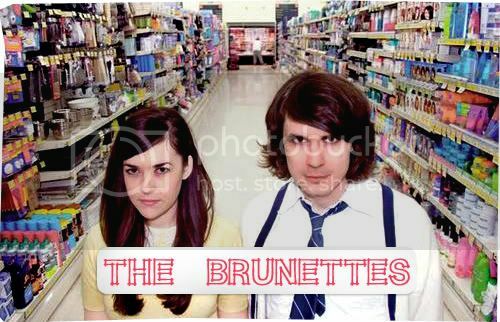 But the Brunettes sure has a way of placing a whimsical twist into their words in order to work with their melodies; ‘Her Hairagami Set’ is a recitation of ‘Hairagami’ hairdo jargons sung in the lilting coos of Heather Mansfield, while perfectly balanced off with Jonathan Bree’s downbeat vocals. The small bits of idiosyncrasies that runs throughout their latest release, Structure and Cosmetics, merits itself worthy of repeated listening. This is evidently showcased in songs like the adrenaline-pumping, exuberant opener ‘Brunettes against Bubblegum Youth’ (in other words, ‘B.A.B.Y’), and the chirpy, cheery ‘Obligatory Road Song’, that contains upbeat melodies and sumptuous instrumentation capable of putting you in a ridiculously bright mood.